Insights is a research about the relation of two bodies exploring breath as a shared need and connection in a geometrical system of figures. 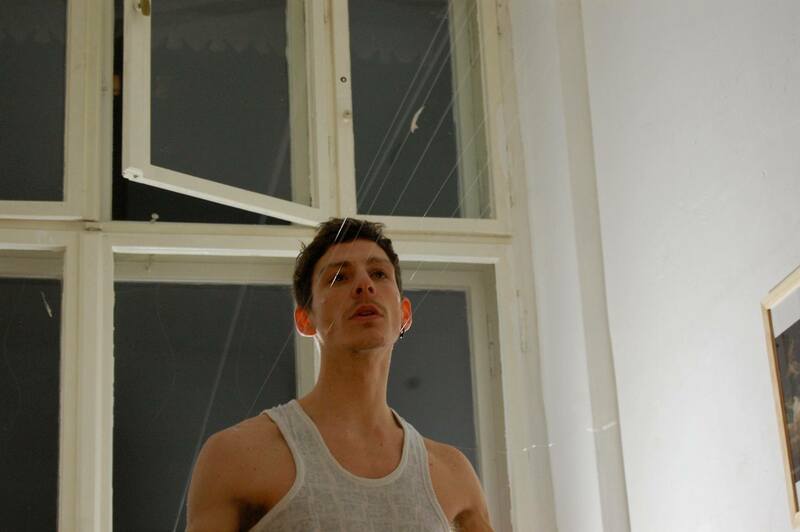 Performed for Moscow Biennale for Young Artists, taken place in room installled by Christina Georgiou. Insights, Moscow Biennale for young artists (2010), with Johanne Timm. Insights is a research about the relation of two bodies, exploring breath as a shared need and connection in a geometrical system of figures. The performers are attached to nylon strings in order to play with the tension and a third body is created in between. 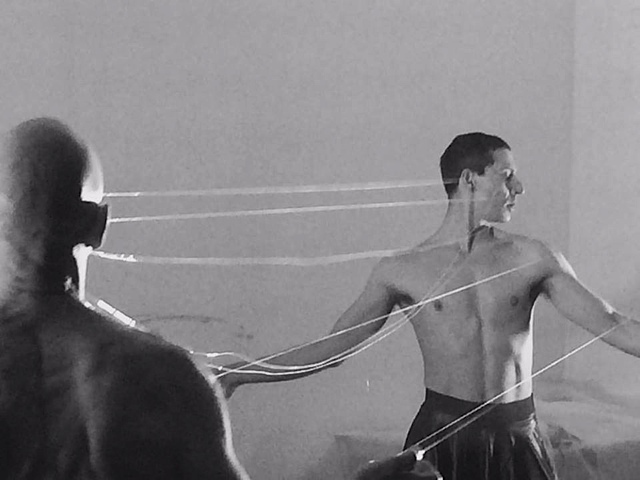 The performance starts with the unison of two bodies one behind the other. Slowly they separate and translate their figures beside each other to tune their connection with themselves and the public. An imaginary axis divides the two performers and they rotate on that hinge until they face each other. On the outline of their bodies 16 nylon strings, 3 metres long each are attached by a specific transparent glue, suitable for the skin. Both are linked and move reflecting each other forming an equivalent. Stepping backwards the 16 strings will start to straighten until they slowly get into tension. In physics, tension is the magnitude of the pulling force exerted by a string, or similar object on another object. It is the opposite of compression. Tension is measured in relation to the string on which it applies. There are two basic possibilities for objects to be held by strings in a system. Either movement is constant and the system is therefore in equilibrium or there is acceleration and therefore a net force is present. 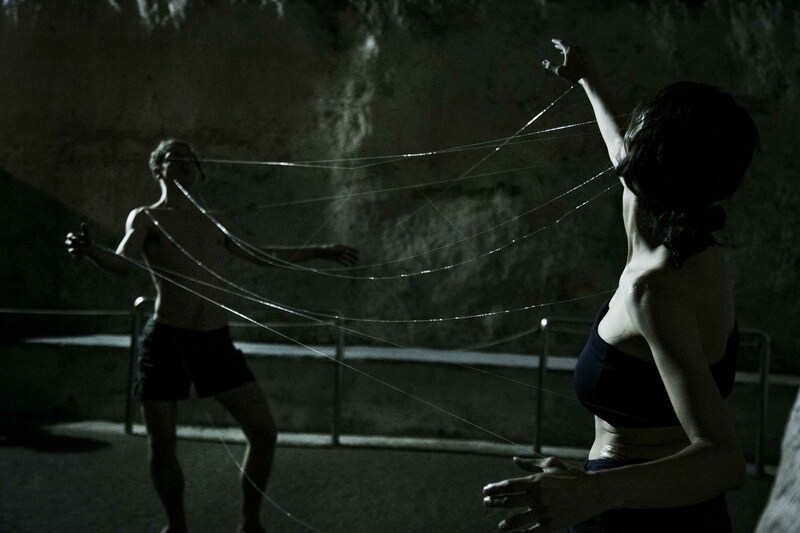 The two performers and the strings are the system that is in equilibrium when the bodies are diaphanous, communicating. This requires listening and coordinating impulses to operate in unison. The strings of nylon are a visible connection, like cables that transmit information. The glue links the strings to the skin, the surface of the body. The in- and out- breath is communicating vividly between the performers. Slowly a synergy between the performers establishes. When the pulling force increases or one of the performer moves independently without communicating, the nylon strings will cut off. This risk and fragility is subject to the whole performance. Once the nylon connections are detached the visualization of the third body vanishes. You can perceive the third body in between the two figures whose outlines are attached by the strings. By pulling the strings the points of the outline translate in space, like a figure in geometry. The area created in the middle seems like an empty, negative space. The perception might shift and the space is like a solid, positive figure itself. Insights is looking for the inbetween.